This post contains affiliate links. This means that if you click through and decide to make a purchase, the price you pay stays the same but I might receive a small commission that helps me keep the blog going. Thank you for your support. It came about after I had some leftover, cooked turkey steaks and some bacon - and raided the fridge for whatever else I could find to go with it. I grabbed the figs while thinking they would work so well with the salty, smoky bacon. And then I found the raspberries. I couldn't decide which to use, so I threw both on. And finished it with some crisp, shredded little gem lettuce and a drizzle of pomegranate molasses and olive oil dressing. It's sweet, salty, smoky and tart. It's soft, crunchy and aromatic. It's probably one of the best salads I've ever eaten. Arrange the little gem lettuce on a plate with the cooked turkey and bacon. 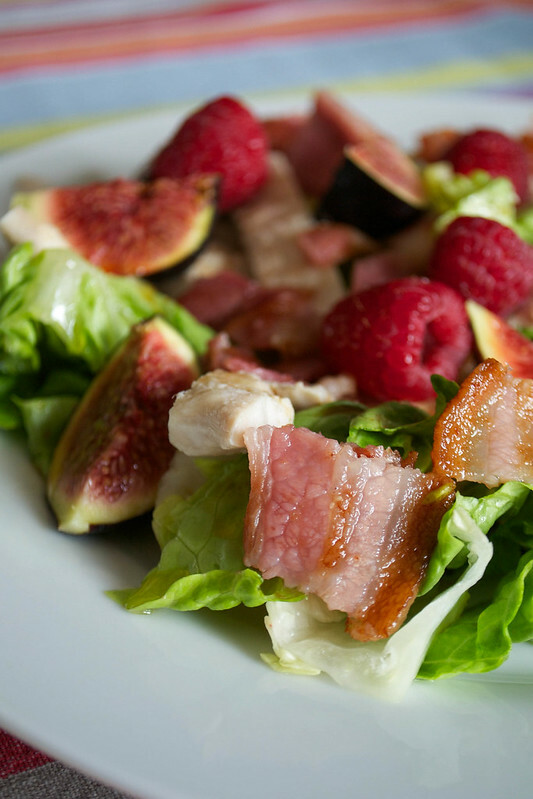 Tuck in the fig slices and scatter over the raspberries. Mix the olive oil and the pomegranate molasses together and then pour over the salad. Eat straight away.